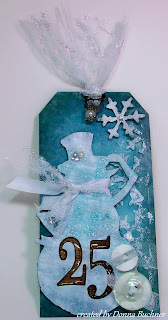 I was finally able to go and pick up some picket fence distress stain and had a lot of fun playing with it! The blue background looks really dark in the photo but it really is a lighter blue. The "25" was filled in with the glossy accents, something that I have never done before and it turned out great. Love that effect.